Free Christmas mp3s from Amazon.com! Amazon’s giving away a free Christmas mp3 — and not just for today, but every day, for the next 25 days! Just keep pointing your computer’s web browser to tinyurl.com/25xmasMP3s. 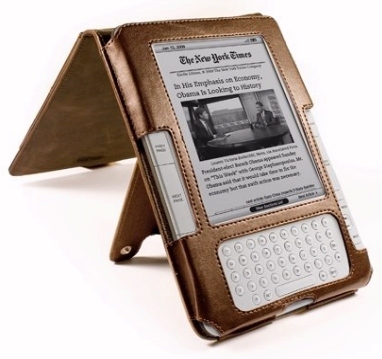 (If your Kindle has an mp3 player, you can finally stock it with some holiday music!) And Amazon’s also created a free “Santa” app for the Kindle Fire (and the iPad) which lets children create a wish list of Amazon items — for Santa Claus! The free mp3s are on a special “25 Days of Free” web page that’s designed like an advent calendar, where a new surprise gets revealed every day as a countdown to Christmas. Except here, the calendar’s squares get replaced by album covers! 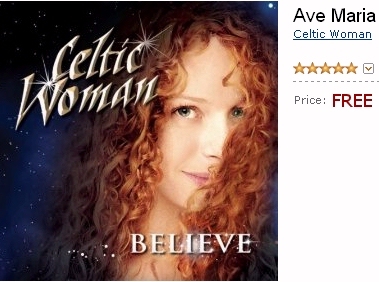 For December 1, Amazon’s offering a lavish Christmas song by the Celtic Woman group — their rendition of the traditional song Ave Maria. It’s a preview of their yet-to-be-released new album, “Believe,” which won’t be available until January 24 of next year! Snowflake in my pocket, let’s take a sleigh ride on the ice. Dream with me this winter night. except the selection actually does includes some of my all-time favorite Christmas albums, including Christmas with the Rat Pack, A Jolly Christmas from Frank Sinatra, Bing Crosby’s I Wish You a Merry Christmas, and an expanded version of Vince Guaraldi’s music for “A Charlie Brown Christmas.”. There’s also Christmas albums from Weezer, Christina Aguilera, Zooey Deschanel’s band “She and Him,” and even the cast of Sesame Street – plus some performers you wouldn’t expect, like Bob Dylan and Twisted Sister.